1 of 7 Heat oven to 350 degrees F.
2 of 7 On a well floured surface, knead the flour into the dough. Knead in the mint extract until completely incorporated. 3 of 7 Divide dough in half. Knead about 8 drops of green food coloring into half the dough. Knead about 8 to 10 drops of red food coloring into the remaining half of the dough. Form into disks, cover and refrigerate for 10 minutes. 4 of 7 Roll each disk between 2 sheets of parchment or waxed paper to a 1/4 inch thickness. Slide onto baking sheets and refrigerate for 15 minutes. 5 of 7 Cut each dough into tree shapes using a 4-inch cutter. 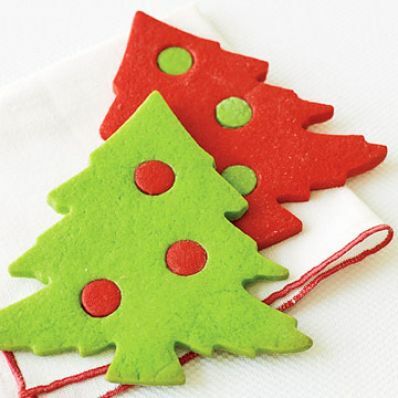 Cut dots out of cookies with a 3/4-inch round cookie cutter (see note). Place on baking sheet. Form scraps into disks and refrigerate for at least 15 minutes. 6 of 7 Exchange dots between between the different colored cookies, green in the red trees and visaversa. Reroll scraps and cut out additional cookies. 7 of 7 Bake at 350 degrees F for 10 minutes or until cookies are puffed and set. Remove to a wire rack and let cool 1 minutes. Remove cookies from baking sheet to wire rack and allow to cool completely.